Currently celebrating 16 years in business, Michael says. I learn the most about design by reaching beyond practical and aesthetics qualities, to understand how a place will affect people. “I learn the most about horticulture by working with plants and understanding what conditions they need to thrive. After a while you just know what is going to work. I never approach a project with a one-size-fits-all attitude,” he insists. “My great grand parents were big wheat farmers in Pullman, Washington. When I was growing up, mother grew geraniums from seed and spaded up the vegetable garden every spring. I learned a lot,” he recalls. After a remodeling job gutted much of the family’s half-acre in North Seattle, Michael was given his first design project. “I had full reign”, he recalls. During the process of planning the garden, he watched as contractors build decks, patios and place rocks. “I learned more about the design and construction side of things.” He started to learn the botanical names of plants. After studying Latin for three years in high school, Michael continued on to the University of Oregon to study design and fine art. A home on Mercer Island, after . . .
and that Mercer Island home before. And the same Lake Samammish home after work was completed. Alongside a driveway in Madison Park, before landscape design . . .
And the same spot today. And how it welcomes visitors today. After the design work, it's hard to pass the spot without taking a seat. Michael Muro and his team understand how environment and aesthetics affect buying decisions and how to maximize the value of a property. 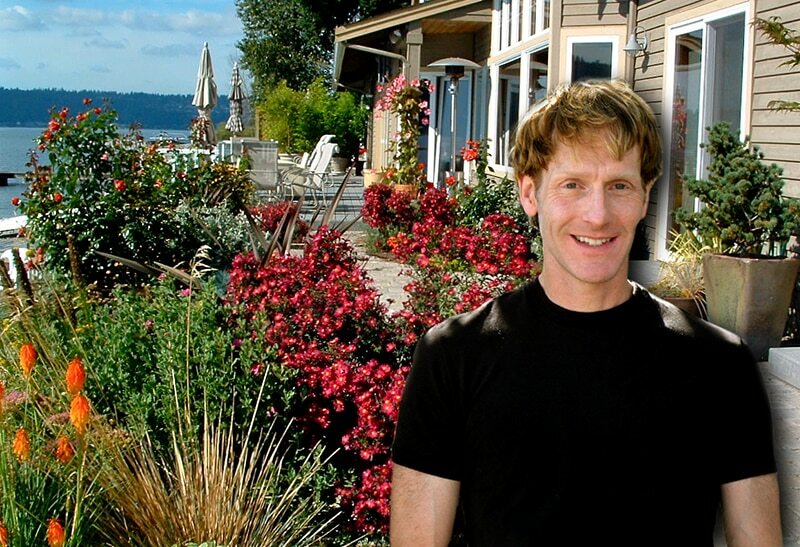 This is a great asset to Marilyn Smith Real Estate and other realtors listing homes in the Seattle area. “ I love working with Marilyn because she really gets it. She understands what we are doing and the value it brings.” People may wait to look at enhancements like landscaping until they feel the need to upgrade their property in order to list it,” Michael says. Each year, according to a 2013 Harris Interactive survey, ten percent of Americans hire professionals to dress up their properties, spending less than half what the average family spends annually on clothing, thus resulting increased curb appeal added value. “I try to urge folks to think long term. Then they have a chance to nurture and enjoy their garden as it matures.” New construction often leaves new owners with uninspired, standardized landscaping or none at all. They want to make it their own – they want something more personal that fits their lifestyle. We feel confident recommending Michael because he looks at the big picture and makes suggestions based on the clients needs and interests. “I focus on creating privacy,” says Muro. “Big houses, even with big yards, often are close together. My work includes creating spaces that are intimate – where people want to be. When asked about landscaping for erosion control, Michael cautions “Any slope area must be carefully assessed. There are city codes that dictate protocols based on the location and severity of the slope. For minor concerns in average garden conditions, a lot that can be done by selecting appropriate plants and ground cover. “There are a lot of variables we consider when planning a garden. We bring a wide range of considerations to the job,” Muro says. “It is important to understand the micro climate of a site to do it justice. 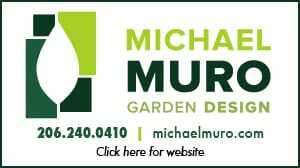 Michael Muro is a member of APLD, WALP, and The Dunn Gardens Foundation, Friends of the Conservatory and the American Horticultural Society. For more information visit michaelmuro.com or call (206) 240-0410.